Basketsgalore.ie is the new Euro Zoned online gift hamper and basket website catering for all those occasions when you want to send a gift, but find it difficult to get there in person. The vast majority of our products are Irish. There are a few exceptions and the reason for this is that some things are not made in Ireland and that some products are so niche that they cannot be profitably produced in Ireland. Look at the contents of this gift basket. Qi Tea, Olives et al, Wyndham Estates, the Basket. A total of 17 items of which 4 are not made in Ireland. However, Ireland doesnt grow bamboo or wicker, so it can't manufacture baskets. Ireland can't produce wine, so we're left with Qi Tea and Olives et al. We included these products because Olives et al has superior packaging and better quality olives and we included the Tea once again because of its packaging and quality of taste. So 13 from 15 products are Irish. However, the primary products within this gift basket, which make it stand out are really the Ummera Salmon, which is from Cork and the Connemara air Dried Ham, which is from the Brady Family. The cheeses are from Tyrone and the Apple Juice from Armagh with the jarred items made in Down by the Multi Award Winning OffBeat Company. So in terms of value, the hamper is over 95% Irish if source of origin is an important purchasing decision. So we may not be 100% Irish, but we're so close that you have got to question whether the small differential is worth the extra premium. Our prices are lower because we don't need to make as much money per basket due to our lower operating costs and larger volume of sales. Our main market is the UK, we compete with multi-million pound companies in England and Scotland. To do so, we rely upon our Irish suppliers to produce great quality products at a competitive price. They give our gift baskets a strong distinctive theme, but their quintessential Irishness is not their Unique Selling Point. 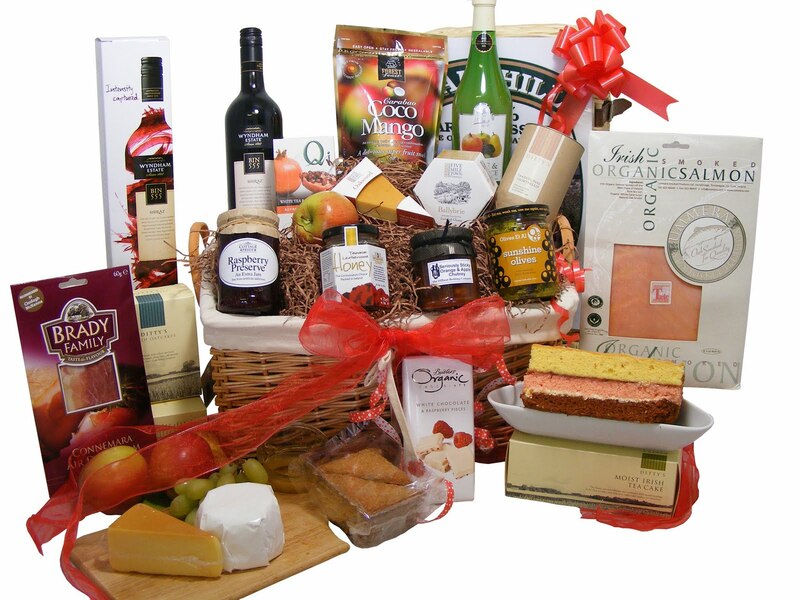 The reason for this is that Basketsgalore is a solution to your gift sending dilemma. You can send one of our hampers or gift baskets for all sorts of occasions and don't forget we also do the most beautiful Baby Gift Baskets for new born babies and new mothers and parents.